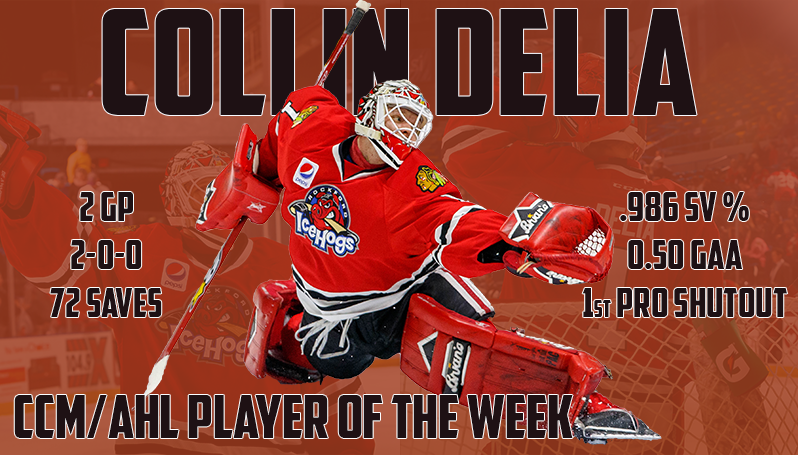 ROCKFORD, Ill. – The American Hockey League today announced that Rockford IceHogs goaltender Collin Delia has been selected as the CCM/AHL Player of the Week for the period ending March 4, 2018. He is Rockford's first player to win the award since goaltender Mac Carruth on April 18, 2016. Delia, 23, helped lead the IceHogs to a pair of victories in his two starts last week, turning aside 72 of the 73 total shots he faced. The netminder finished the week with a 0.50 GAA, .986 save percentage and the first shutout of his professional career. On Wednesday evening, Delia made 38 saves to anchor Rockford’s defense in a 2-1 victory over the Texas Stars. Two games later, Delia stopped each of his 34 shots faced in a 3-0 blanking of the Wilkes-Barre/Scranton Penguins on Saturday night at the BMO Harris Bank Center. Delia was named the game’s first star in each of the two contests last week. The Rancho Cucamonga, Calif. native has combined for a record of 11-6-2 with a 2.78 GAA and .901 save percentage in 19 appearances with the IceHogs this season. He leads the team in wins and is 12th among AHL rookie goaltenders in GAA.